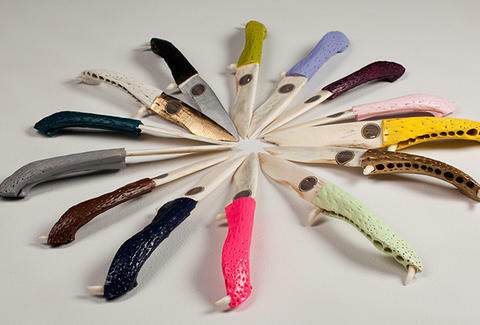 These knives are made from alligator bones. Seriously. 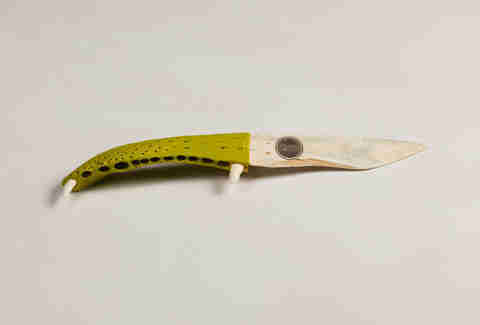 Rendering dead alligators only slightly less dangerous in death than they were in life, Fangblades are a new collection of knives hand-carved from solid gator jaw bones (even the blades! ), with intact teeth at either end of their grips. The current lineup's 13 pieces are each around seven inches long and come with handles painted a range of colors; and while you may feel compelled to try using 'em to cut everything, they're really best suited to just slicing fruit, opening mail, or "self defense", particularly from live gators, who'll scamper away as soon as they see what you've done to their family.